Home Our Attorneys Joseph A. Power Jr.
Joseph Power has obtained more than 200 jury verdicts and settlements in excess of $1 Million, including the largest jury verdict in Illinois history for a medical malpractice case of $55.4 Million and a recovery of $100 Million in a trucking case which led to seventy-six criminal convictions, including the former Governor of Illinois in the “licenses for bribes” scandal, which triggered the retesting of over 2000 truck drivers. He has recovered over $1 Billion for his clients. Recently, in 2017, Joseph Power and James Power obtained a verdict of $95,477,464.00 for a plaintiff who lost both of his legs when he was working as a truck driver and the cargo he was transporting fell onto him. The day after obtaining that verdict, Joseph Power, Larry Rogers, Jr. and James Power set out on another complex trial and obtained a verdict of $33.4 Million for their clients in a negligent security case against Allied Barton. Mr. Power has never lost a medical malpractice case at trial. Mr. Power has tried and recovered numerous medical malpractice cases including $43,000.000.00, $35,000,000.00, $30,000,000, $25,000,000.00, $21,700,000.00, $18,750,000.00, $18,000,000.00, $15,700,000.00, $13,000,000.00, $12,800,000.00, $12,500,000.00, $12,250,000.00, and $12,000,000.00. Each one of his jury verdicts have resulted in the payment of between $43 and $2 million dollars, depending upon the amount of the defendant’s insurance policy. At age 28, he became the youngest lawyer in the country to obtain a jury verdict in excess of a million dollars for his client. Mr. Power tried the case alone after the offer to settle for $75,000 was declined. In another noteworthy case, a local hospital allowed a teenage gunshot victim to bleed until he was near death in an alley outside its doors, until the police came to his rescue and carried him into the hospital. He later died. This case resulted in a federal investigation, review and clarification of the federal law concerning hospital emergency room duties. The family of the deceased teenager ultimately recovered $12.5 million. Mr. Power has obtained similar success in each of his trucking cases. For example, an Illinois family recovered almost $40 million, which was all the insurance coverage available, when a husband and father of two was killed and his teenage daughter suffered serious injuries as a result of a negligent truck driver in Indiana. Mr. Power also obtained a $23 million dollar verdict for a 50 year old man seriously injured in a trucking collision in Illinois. In another case, Mr. Power represented the then Chief Justice of the Illinois Supreme Court where a jury awarded $7,000,000.00 for defamation. In 2015, Mr. Power and Joseph Balesteri teamed up to recover $30,000,000.00 for a patient who ended up losing two kidneys after a surgery that was only supposed to remove one. Again in 2015, Mr. Power and Mr. Balesteri recovered $6,900,000.00 for the wrongful death of a wife and mother as a result of negligent post-delivery care. In addition, Mr. Power and Devon Bruce recovered $3,750,000.00 in Sangamon County for a 19 year-old who suffered from juvenile glaucoma and lost vision as a result of malpractice. Also in 2015, after almost three weeks of trial and prior to closing arguments, Joe and his brother Tom recovered over $6,000,000.00, which was more than three times the offer prior to trial. In 2014, Mr. Power and Mr. Balesteri recovered $8,000,000.00 for a woman who was not treated for a pneumothorax after an auto accident resulting in brain damage. Mr. Power also recovered $5,400,000.00 for the family of a 15-year-old boy who drowned in Lake Michigan while attending a summer camp. In February 2013, prior to jury selection, he settled a medical malpractice case for a brain damaged child for $35,000,000. In March 2013, Mr. Power obtained a $23,000,000 award for a young man who lost his legs in a bailor. In May 2013, he obtained a record verdict following a two week trial for his client in Ogle County of $5,000,000 in a motorcycle collision. He returned to Cook County and in July 2013 obtained a $7,250,000 trial verdict for a school teacher who was killed as a result of medical malpractice. In late 2012, Mr. Power obtained a jury verdict of $3.1 Million Dollars for a 45 year-old Hispanic woman who was killed by a motor vehicle in an unwitnessed hit and run on Chicago's south side. Complicated forensic evidence developed by Mr. Power tied a school bus to the collision after the police department failed to charge anyone. The defendant’s insurance company offered only $500,000 to settle. Mr. Power is a past President of the Illinois Trial Lawyers Association and current President of the Inner Circle of Advocates, which is a legal organization consisting of the best 100 plaintiff trial lawyers in the United States. In addition, he is a Fellow of the American College of Trial Lawyers and the International Academy of Trial Lawyers. He is the immediate past President of both ABOTA (Illinois Chapter) and the past President of the Celtic Legal Society. Mr. Power has been listed in the Harvard Law Graduates Naifeh and Smith book, The Best Lawyers in America, every year since 1987. The same publication names him the top personal injury lawyers in Illinois in 2014. The National Law Journal recognized him as one of the top ten litigators in the United States. Additionally, Joe has been repeatedly selected as one of the top lawyers by LawDragon, a group which selects the top 500 lawyers in the country, since inception and again in 2015. In 2013, he was named in a poll of his peers by the Leading Lawyers Network as the top plaintiff personal injury lawyer and the top consumer attorney in Illinois. Power Rogers & Smith has recovered over $4 billion dollars in verdicts and settlements. Power Rogers & Smith has achieved the #1 spot in the Chicago Lawyer Annual Settlement Survey again in 2018, meaning the firm obtained more dollars in recoveries than any other Chicago personal injury law firm in Illinois. In fact, Power Rogers & Smith has finished first in the settlement survey in ten of the last fifteen years and has held the first place spot for the past nine consecutive years, surpassing its next closest competitor by more than half a billion dollars in total recoveries since 2000. Joseph Power and Larry Rogers, Jr. represented a Chicago family that lost six children in a fiery Wisconsin car crash in 1994 caused by an unqualified truck driver. Investigations prompted by the tragedy and lawsuit revealed widespread corruption, whereby the Secretary of State’s staff exchanged licenses for bribes that went to the campaign of George Ryan. These federal investigations triggered Operation Safe Road, which required retesting for over 2,000 drivers using tainted licenses and netted 76 convictions, including that of former Governor of Illinois George Ryan. Joseph Power and Larry Rogers, Jr. obtained a record $100 million settlement for personal injury and wrongful death for a single-family. R. M. v. Metal-Matic Inc.
Power Rogers & Smith attorneys Joseph Power, Jr. and James Power recently secured a $95,477,464 million jury verdict for our client who suffered massive leg injuries that required a double above-the-knee amputation in 2014. Our client, a truck driver, was transporting carbon steel tubing. The crane operator at the delivery location attempted to unload the cargo, but because the tubing was improperly stacked and configured for unloading, one bundle of the tubing rolled out and crushed his legs, lacerating his right popliteal artery and fracturing his fibula and tibia. His right knee was amputated above the knee, and after his left leg developed a fungal infection, the doctors had to amputate that one above the knee as well. This case involved the failure to properly give oxygen or intubate and give oxygen to a 54-year-old-lady undergoing a bronchoscopic procedure and biopsy for possible tuberculosis which resulted in brain damage. This is the largest medical malpractice verdict in the history of the State of Illinois. Additionally, the loss of consortium of $15,000,000.00 to the husband is also the largest such award in the history of Illinois for that type of damage. Medical Malpractice: 12 year old girl presented to a Local Community Hospital on October 18, 2016. The employed hospitalists involved in her care and treatment failed to diagnose neck abscesses by CT scanning, failed to recognize her clinical deterioration and organ dysfunction due to infection and failed to timely transfer her to a children’s hospital. The employed interventional radiologist and otolaryngologist failed to perform a sedation assessment, failed to recognize a class IV airway, failed to recognize developing sepsis, failed to protect her airway before giving inappropriate sedation and failed to timely transfer her to a children's hospital. These providers failed to recognize deep neck abscesses when treating mononucleosis and streptococcal infection leading to continued clinical deterioration. As a result, the minor suffered catastrophic irreversible neurologic injury due to a cardiorespiratory arrest. This is the largest settlement for a brain injured-minor in the history of the State of Illinois. Co-counsel with Joseph W. Balesteri. L. v. Active Transportation Company, LLC, No. 00 CV 8448. L., 43, was driving with his wife and children as passengers when he slowed down due to construction on the highway in Lafayette, Indiana. A truck struck him from behind, causing his car to burst into flames. L. sustained fatal injuries. He is survived by his wife and two minor children. His wife sustained facial fractures, a concussion, bone bruising, lacerations, and sprains. His daughter suffered second and third degree burns, requiring amputation of her left leg and the toes of her right foot. She also fractured multiple broken bones in her pelvis and fingers. L.’s son suffered second and third degree burns to his legs. On December 18, 2011, the Plaintiff Mother presented to the hospital for labor and delivery. Pitocin was administered at 7:30 p.m. to augment labor contractions. Fetal heart rate monitoring began at 7:30 p.m. and was normal and reassuring through 10 p.m. Plaintiffs’ alleged that the fetal monitoring tracings became non-reassuring and abnormal after 10:00 p.m. through delivery at 12:28 a.m. the following morning. Plaintiffs contend that had Mom delivered between 10:30 p.m. and 11:00 p.m. on December 18th, A. would have been neurologically normal. Because of the delay in delivering A., she suffered brain damage and resultant spastic quadriplegia, cerebral palsy and seizures. This settlement is a state record for a child injured at birth. Minor plaintiff at three months of age was intubated by defendant physician. Plaintiff alleges that defendant doctor and undisclosed hospital were negligent in the failure to intubate Dalian causing subglottic stenosis. The subglottic stenosis subsequently required the plaintiff to have a tracheostomy. In September of 2006, the minor plaintiff was hospitalized at a separate hospital when the tracheostomy tube occluded and caused an anoxic event. Plaintiff did not receive proper oxygenation for approximately 12-15 minutes. Plaintiff alleged that the defendant failed to monitor the plaintiff while hospitalized. As a result of the anoxic event, plaintiff sustained permanent damage and is a spastic quadriplegic. He suffers from cortical blindness and requires a gastrostomy tube. This is one of the largest settlements in Illinois history. Wrongful Death, Negligent Security: The Plaintiffs worked for a law firm in the large office building located at 500 West Madison Street. Allied Barton provided Security Services to the building. On December 8, 2006, a former client of the firm’s entered the 500 West Madison office building armed with a revolver, chain, padlock, hunting knife, and hammer in order to seek out and kill one of the attorneys who he mistakenly believed had wronged him. After loitering in the building’s lobby and being turned away by the security desk, the former client was permitted access to the law firm, located on an upper-level floor, by Allied Barton security. Once he had gained access to the law firm, he shot and killed three individuals and injured the fourth. Joseph A. Power, Jr. represented the Estate of M.M. and recovered $14.6 million for his client. Larry R. Rogers, Jr. represented the Estate of A.H. and secured an $11 million verdict for his client. James Power represented R.L. and secured a $5 million verdict. 46 year old male presents for a laparoscopic nephrectomy due to kidney cancer. During the procedure, aortic transection and ligation occurred with a stapling device which was not recognized by the healthcare practitioners until the patient’s transfer to an outside institution. Additionally, injuries to the right kidney were caused by a stapling device which had transected and ligated arteries to the right kidney. As a consequence, the Plaintiff is a paraplegic and requires permanent dialysis. On February 22, 2008, Plaintiff AG’s legs became crushed in a paper baler at a factory owned and operated by Defendant factory owner and Defendant factory operator. Prior to injury, AG entered a large chute/tube, which feed the baler from above, to clear a jam by using the weight of his body. When the jam cleared, AG was caused to fall into the baler. He did not have fall protection at the time of the incident. Nor did he have training on OSHA lockout/tagout procedures. After AG fell, the baler’s ram crushed his legs. AG was working, as a janitor, for a cleaning company at the time of the incident. The Defendants hired the cleaning company to do janitorial work and light industry work. Defendants brought a third party complaint against the cleaning company. The complaint alleged that Defendants violated OSHA and applicable safety standards, by failing to: (1) ensure that AG was properly trained on how to safely unclear paper jams; (2) ensure that he had available and used fall protection such as lanyards and harnesses; (3) ensure that lockout/tagout was followed while the machine was being worked on and/or he was in the chute/tube; (4) provide a hazard assessment; and (5) ensure there is adequate warning signs and the hatches are secured by locks so only authorized personnel entered the chutes/tubes. Defendants denied that they knew AG or other cleaning company employees entered the tube/chute to unclog it on the day of the occurrence, or at any time prior to the occurrence. They contended that AG and the cleaning company, as AG’s employer, were the entities liable for his injuries. However, there was evidence that individuals had entered the chute/tube to clear paper jams in the past. The Defendants and Third Party Defendant received OSHA violations as a result of the incident. AG sought recovery for the cost of past and future medical care, wage loss and all other available damages. This product liability case involving children who suffered brain damage as a result of baby formula. Plaintiff was stopped at the Edens Spur ramp at the beginning of a construction zone back up on the Edens Expressway. He was rear-ended by a tractor-trailer owned by the defendants and operated by an employee and/or agent of the defendants who was traveling at least 65 m.p.h. The driver testified he applied his brakes prior to the collision, but did not have time to stop. He claimed he had just exited a curve. The collision occurred after 3,000 feet of a straight roadway near the tail end of the Edens Spur. He sustained a C5-C6 tetraplegic injury. Prior to jury selection the Defendants admitted liability. This was accepted by the plaintiffs. Prior to trial, the defendants offered $10,000,000 to settle. During the trial the defendants incrementally increased their offers to $15,000,000 and then $20,000,000. After closing arguments the defendants offered a high/low agreement of $25,000,000 - $50,000,000. After a jury verdict of $23,000,000 the case settled under a high/low agreement entered into after closing arguments for $25,000,000.00. Power Rogers & Smith attorneys Joseph A. Power Jr., as lead counsel, and Sean M. Houlihan and James Power recently obtained a $21.6 million dollar verdict on behalf of a truck driver and his wife. Our client suffered a traumatic brain injury after a defectively designed grab handle on his truck broke and caused him to fall. The case involved many disputes about jurisdiction and where the case was to be heard, and was recently featured in an article published by the Chicago Daily Law Bulletin. Decedent was admitted to Trinity Hospital on February 8, 1998 at approximately 5:30 a.m. at term. She was given an epidural anesthetic at approximately 6:49 a.m. when her blood pressure dropped into the 70s and then into the 50s. Fetal bardycardia was shortly thereafter detected on the fetal monitor and Decedent was place in Trendelenberg position. Dr. Jiha, the attending anesthesiologist, was paged at approximately 7:30 a.m. for low blood pressure. The nurse anesthetist continued to administer fluids including Ephedrine in order to correct the hypotension. A house doctor and obstetrician, Dr. Moreland, was called because of the fetal bardycardia on the monitor but she determined that a cesarean section was not necessary. Thereafter Susan complained of being dizzy, vomited several times, became confused and cyanotic. At 7:45 a.m. Decedent’s blood pressure again dropped into the 70s and more fluids, including the Ephedrine, were given. According to plaintiff’s experts Decedent’s blood pressures were abnormal for almost two hours. According to plaintiff’s experts intubation was required much earlier and her oxygen status should have been monitored more closely. Additionally, earlier intubation was required and her oxygen status should have been monitored more closely along with a cesarean section operation at least an hour earlier. Decedent died after being in a coma for twelve weeks and her son was left permanently brain damaged and unable to care for himself. The case for the disabled minor son settled for $11,250,000.00 and the wrongful death action for his mother settled for $10,025,000.00. Plaintiff underwent cervical disc surgery at Thorek Memorial Hospital on June 14, 2006 because he was having neck pain which radiated into his left arm. Post-operatively, he experienced difficulties moving his toes, feet and then legs. Ultimately, this progressed to his arms within about six or seven hours of surgery. By June 15, 2006, Plaintiff was a quadriplegic. On June 14, 2006 when surgery was completed, while in the operating room, Plaintiff could move his upper and lower extremities per the testimony of three witnesses. He was taken to the post-anesthesia care unit (PACU) for recovery at 11:10 a.m. In the PACU he was seen by two nurses and an anesthesiologist. Both nurses noted that Plaintiff could not move his legs. No-one told the anesthesiologist, nor the operating neurosurgeon who was involved in another surgery. Plaintiff was transferred out of the PACU to the ICU by the anesthesiologist who was unaware that he couldn’t move his legs. In the ICU, he was seen by two different nurses assigned to him for the next approximate 20 hours. Neither of these nurses advised any physician that Plaintiff couldn’t move his legs and that he was losing the ability to move his arms. The first ICU nurse, on duty until 7:00 p.m., claims to have activated the nursing chain-of-command during his shift, having advised all of his nursing supervisory personnel (charge nurse, house physician, nursing supervisor, client nursing officer) of Mr. Contreras’ situation as well as the house physician. The other hospital staff denied ever receiving this information, and denied sitting in a room talking about how to reach the neurosurgeon for an hour or two as claimed by this same nurse who was assigned to Plaintiff. Later, around 8:00 p.m. an agency nurse took over the care of Plaintiff and didn’t call anyone about his condition because he was advised by a charge nurse that Plaintiff could not walk at the time he first came to Thorek Memorial Hospital. This nurse claimed that he didn’t have access to the medical records to confirm the accuracy of that information when he was providing Plaintiff’s care because he didn’t have access to the computer and the chart isn’t something he normally reviews. Wrongful Death, Car Accident: In June of 2008, the Plaintiff sued the driver of the vehicle that crashed into his children as well as multiple construction contractors, alleging that a road barricade placed in the wrong location caused the Defendant-driver to collide with an oncoming vehicle, which caused her vehicle to crash into the sidewalk where three children were standing. A 36-year-old man became paralyzed on his left side as a result of a stroke. His family physician and emergency room doctor were found to be negligent in failing to diagnose subacute bacterial endocarditis. This is the largest medical negligence verdict in Illinois history and the largest in the U.S. in 1991 according to the National Law Journal. This verdict was reduced $2,238,141.00 for economic damages awarded above the present cash value of lost earnings and future attendant care needs found in the evidence or requested by plaintiff at trial. At the time this case was the largest verdict ever affirmed on appeal in Illinois. Affirmed on Appeal 92-2262 268 Ill.App.3d 1051, 645 N.E.2d 284 (1994). January 1st until 12:45 p.m. when she had an eclamptic seizure. Her child, R., was delivered at 1:19 p.m. with very low APGARS and a cord blood gas indicating she suffered from hypoxia and ischemia. She remained depressed for approximately thirty-six more minutes due to the failure to adequately resuscitate her. As a result, R. sustained brain damage and is currently institutionalized. The defendants denied that they were negligent, denied that R.’s mother was preeclamptic and instead have suggested she suffered a seizure as a result of an enterovirus which they claimed was found in the placenta. The defense alleged this enterovirus attacks newborns and, in fact, was responsible for aseptic meningitis evidenced by elevated white blood cell count in the cerebral spinal fluid of R. as well as abnormalities in the placenta. It was the defendants’ position that this enterovirus was the sole proximate cause of R.’s problem and was untreatable. Minor Plaintiff was born with a heart that was not formed properly. Doctors picked up an irregular heart beat prior to her birth. Plaintiff alleges Defendant doctors failed to properly admit her into the hospital and failed to properly monitor her resulting in her death at approximately 8 months of age. The cause involved the wrongful death of R.S., who was a 47 year old auto worker, who was returning home from work on the evening of October 16, 2004, when he was killed while operating his motor vehicle southbound along Indiana’s I-465 within the city limits of Indianapolis, Indiana. A tractor-trailer operated by Tadeusz Strojny was also traveling in the middle lane of the southbound traffic along I- 465. Mr. Strojny’s tractor-trailer struck Mr. Studer’s vehicle from behind, propelling and pinning it along the I- 465's median wall. Ronald Studer was unable to escape his vehicle and died as a result of his injuries. Tadeusz Strojny was employed as a truck driver by Defendant, Right Express, Inc. d/b/a E.R.A. Transportation, Inc. The tractor was owned by Defendant, HMD Trucking, Inc., for whom Mr. Strojny was driving. He was pulling a trailer owned by Defendant, FAF, Inc. with an insignia of Forward Air, Inc. stenciled on the side of the vehicle. Mr. Strojny was a Polish born individual who is not fluent in the English language. On the date of this occurrence Mr. Strojny had picked up the tractor-trailer at the Forward Air depot in Chicago, Illinois and was taking it to Columbus, Ohio. On February 13, 2002, H. presented to Dr. Lopes at Rush University for a second opinion on treatment of an unruptured, small (3x5 cm), left internal carotid artery aneurysm that was incidentally found in a January MRA for an unrelated condition. Dr. Lopes recommended that H. undergo a neuro-interventional coiling procedure whereby a micro-catheter would be inserted into the femoral artery and advanced through her body and into her skull for purposes of delivering small platinum-coated coils into the aneurysm. H. agreed and on February 20, 2002, Dr. Lopes performed the procedure at Rush University. Within an hour of the procedure, H. was documented as experiencing nausea, vomiting and headache. She subsequently arrested and after being resuscitated was taken for an emergent CT scan where an intracerebral hemorrhage was diagnosed. Despite emergency surgery, H. was left profoundly brain damaged. a stiffer and more rigid guidewire, designed for larger heart vessels, into the left internal carotid artery of H.’s brain. Plaintiff’s alleged that this was a non-FDA approved use of the stent device that was not indicated given that H.’s aneurysm was small (3x5 cm), asymptomatic and unruptured. Dr. Lopes’ use of the stiffer and more rigid guidewire and coronary stent required the application of torque and force to manipulate the devices through the curves of the intracerebral vessels causing the tip of the guidewire to perforate a distal branch of H.’s middle cerebral artery resulting in an intracerebral hemorrhage. Plaintiff’s alleged that there were signs of an intracerebral bleed during the procedure and immediate post-procedure period that Dr. Lopes and the nursing staff failed to recognize. Plaintiff’s alleged that Dr. Demetrius Lopes and Rush University spoiled evidence of the bleed when 12 of 19 angiography runs from the procedure were not produced and had not been saved on the system’s hard drive. On April 8, 2003, Plaintiff underwent a radical open anterior and posterior slovenectomy for a rare knee disease. She underwent the surgery at VHS Subsidiary Number 3, Inc. d/b/a Louis A. Weiss Memorial Hospital. The surgery was performed by the attending physician, who was not an employee of VHS Subsidiary Number 3, Inc. d/b/a Louis A. Weiss Memorial Hospital. The Plaintiff and her expert did not contend that the attending was liable for compartment syndrome, which was a risk of the procedure. Upon examination immediately following surgery, Plaintiff had no complications and a normal neurovascular status. Into the night of April 8, 2003 and morning of April 9, 2003, Plaintiff repeatedly complained of pain below her knee and in her foot and had an abnormal neurovascular status. In response to her complaints, she was given repeated doses of pain medication and her dosage of medication was increased. Moreover, two resident physicians were contacted by the nursing staff but did not come into the hospital to examine Plaintiff. Attending Physician was never contacted about Plaintiff’s complaints or abnormal neurovascular status. Upon examination by the attending physician, at around 6:30 AM, Plaintiff was diagnosed to have compartment syndrome. Shortly thereafter, the attending physician performed a fasciotomy surgery to treat the compartment syndrome by relieving the pressure caused by the compartment syndrome. In the weeks following the initial fasciotomy surgery, Plaintiff required several debridements due to necrotic muscle and tissue below her knee. As a result of the debridements and prolonged compartment syndrome, Plaintiff lost approximately 90% of the muscle in her lower extremity, has foot drop and severe nerve dysfunction. The Plaintiff claimed that the nurses and resident physicians failed to adequately recognize the significance of Plaintiff’s condition and communicate her condition to the attending physician. Plaintiff further claimed that this lack of recognition and communication prevented a timely diagnose and treatment of the compartment syndrome which resulted in Plaintiff;s extensive muscle and tissue death in her lower extremity. On December 22, 1999, United/Goedecke Services, Inc. was lifting a 25 foot I-bar utilizing a hoist called a tugger when the 25 foot I-bar fell 110 feet, striking and killing R.. R. was the signalman, directing a 25 foot I-bar up the tugger bay. The plaintiff alleged the defendant was negligent in failing to more securely attach the I-bar as it was lifted up the tugger bay. The defendant claimed that R. never should have been in the tugger bay, under a load, while it was being lifted and should have used a radio next to the tugger operator and outside the bay as a safer, more effective means of communicating. They also claimed R. adjusted the sling, altering the cinch point which was responsible for it falling upon him. On October 12,1997, R. was run over by a commercial boat named the Sea Dog, near Oak Street Beach in Chicago, Illinois. It was almost six weeks after the swimming season was over and the beaches were closed. The plaintiffs argued the vessel came too close to shore, failed to keep a proper look-out and that the defendant failed to properly train its captains in the rules of the U.S. Coast Guard as well as its own rules. The defense argued that with the swimming season over and the Chicago beaches had been closed for almost six weeks it was unforeseeable that there would be a swimmer in the water over fifty yards from shore, with a 60 degree water temperature, three to five foot waves and a small craft advisory. A Chicago Park District rule prohibits swimming over 50 yards off shore. Prior to the trial commencing the defendants offered $3,000,000.00. During jury selection the defendants offered $5,000,0000.00. It was suggested the offer would never exceed that amount which was equal to the largest amount ever awarded for a below the knee amputation. After opening statements and after three witnesses testified for the plaintiffs the defendants increased their offer to $6,500,000.00. This was the figure the trial judge recommended to settle the case. These offers were rejected by the plaintiffs. The defendants allegedly hyperstimulated a pregnant woman’s uterus with labor-inducing medication and failed to recognize signs and symptoms of fetal distress, causing the woman’s newborn girl to suffer brain damage due to an inadequate flow of oxygen and blood to the brain, resulting in cerebral palsy. As a result of a shooting, S., a minor, sustained a puncture to his aorta, mesenteric vein as well as the colon. He walked as far as he could on to Ravenswood Hospital Medical Center property. S. was within fifty (50) feet of the Ravenswood Hospital door, when security of Ravenswood Hospital was notified of his need of assistance. A nurse employed by Ravenswood Hospital opted to leave Christopher untreated, as their policy was not to go outside the hospital building to assist the injured. He was left to bleed from these injuries for approximately 25 minutes and after he had been transported to the Emergency Room by the police officers he had a barely palpable pulse. Within two minutes of arriving in the Emergency Room he arrested. This is the record settlement in Illinois for the wrongful death of a minor involving hospital negligence. This case settled for a Lake County record of $12,250,000.00 prior to closing argument before Judge Terrence Brady on Friday evening after the jury instruction conference. transiently but did not order hydralzine, an anti-hypertensive. According to one of the plaintiffs’ expert, C. hemorrhaged into her brain between 6:00 to 6:20 p.m. when she started to become less coherent. In addition to suffering from preeclampsia with hypertension C. had HELLP syndrome which made her blood difficult to clot. According to another expert it was negligent not to give C. an anti-hypertensive in the E.R. The baby, Shane, was born healthy, without any medical problems. D. is a 44 year old female who went into the hospital to be treated for left ankle pain. At approximately 11:45 a.m., during an elective biopsy procedure, the patient was turned from the supine position to the prone position. She became hypoxic and her heart beat slowed to a bradycardic level with no pulse. The anesthesiologist, Dr. Rashidi Gani Loya, noticed the patient was turning blue. This is a late sign of hypoxia. She had the patient flipped back to the supine position and started ambu bagging her. The orthopedic doctor started chest compressions on the patient. He then started to perform manual ventilation with the ambu bag as well as chest compressions. Unfortunately, the patient had gone so long without oxygen she had sustained anoxic encephalopathy and permanent brain damage. The plaintiff’s intended on proving that from the time D. was flipped to the supine position until the manual ventilation by ambu bag along with the chest compressions, Linda was without oxygen, in whole or in part for approximately eight minutes which led to her brain damage. During discovery plaintiff learned that the ventilator alarms on the anesthesia equipment did not sound, possibly due to a problem with the automatic ventilator switch which did not automatically restart the ventilator and alarms upon activation. standard 2 to 3, to prevent another emboli. Additionally, they contended in Europe the INR is typically as high as 5. A 29-year-old employee of UHS of Bethesda, Inc. a/k/a Mount Sinai Hospital-North, was diagnosed as having migraine headaches and returned to work by a physician who examined him at the hospital on two separate occasions. A week after the last visit he had suffered a thrombosis which resulted in a stroke and left sided hemiplegia from polycythemia rubra vera which went undiagnosed. The jury found the defendants negligent for not performing a CBC on either visit which would have led to the diagnosis and that the physician was an agent of the hospital. This is the highest personal injury verdict in Illinois for 1995. This case involved a water birth in which just prior to delivery shoulder dystocia occurred. Shoulder dystocia is where due to the large size of the D. M.’s shoulders his mother, C. M., was unable to deliver the baby vaginally without various maneuvers. This occurred when C. M. was still in the tub. Because they were unable to empty the tub as quickly as needed they attempted to deliver the baby in the tub. As a result, she was unable to perform the appropriate maneuvers that were recommended for shoulder dystocia. Due to the delay in delivery Plaintiff contended that D. M. became brain damaged and has suffered severe and significant injuries. (2017) Medical Malpractice: 55-year-old married female presented for removal of her esophagus due to difficulty swallowing and regurgitation. During the procedure, Surgical was utilized but was not removed ultimately migrating into her spinal canal compromising her spinal cord, which resulted in paraplegia and a neurogenic bladder and bowel. When imaging was ordered due to symptoms, the imaging was delayed, thereby delaying spinal cord decompression. Lead Counsel Joseph A. Power, Jr. The 39-year-old lady died as a result of the failure of a physician to perform a spinal tap which would have resulted in the diagnosis and treatment of a subarachnoid hemorrhage and aneurysm. At the time, this was the largest wrongful death verdict in Illinois history. The decedent left a husband and two children. Plaintiff, a former professor at Loyola University of Chicago, on April 20, 1999, went into Evanston Hospital for a decompressive laminectomy for severe cervical stenosis. Prior to the surgery he ambulated with a cane. On April 20th, there was an attempted C6 vertebrectomy for decompression of the spinal cord at the C5-6 level and the C6-7 level. Plaintiffs’ expert contended osteophytes left behind created internal stress to the spinal cord which affected the blood flow to the cord and its function. The large osteophytes left behind at C5 on the right side tethered the cord at the exit point as well as at C6-C7 leaving persistent compression and quadriparesis. The defense experts claimed it was within the standard of care to leave the osteophytes because removing them often leads to paralysis with someone with a severe stenosis as the plaintiff had. Plaintiff, a minor, was struck by a train on August 26, 2000, at the intersection of 123rd Street and Lombard Lane in the Village of Alsip, Cook County, Illinois. Plaintiff was walking in a westerly direction on 123rd Street when a southeast bound train passed the crossing. Plaintiff began to walk in a westerly direction when a train traveling in a northwesterly direction struck him while his friend tried to pull him out of the way. Plaintiff suffered a brain injury and is currently suffering from an incontinent bowel and bladder. He is permanently disabled and attending public high school in an effort to obtain a high school diploma. K. Corporation is a manufacturer of microphones and other electronic equipment. Sjuata Sachdeva was a senior officer at K. Corporation and fraudulently converted several million dollars for her personal use. She was found out, convicted and sentenced to a prison term of 11 years. Grant Thornton was hired by Koss Corporation to perform audits for Koss. It was alleged that Grant Thornton, through its team of auditors, should have discovered the fraud being perpetrated by Ms. Sachdeva and timely reported it to Koss. 53 year old female was transferred by helicopter to Advocate Christ Medical Center from another institution after being involved in an automobile accident. About two and a half hours after arrival she suffered a respiratory arrest followed by a cardiac arrest. Her chest cavity injuries should have been treated by elective chest tube insertion and intubation to avoid possible respiratory deterioration. She suffered permanent severe brain damage and the need for 24 hour care over her lifetime due to these failures. This involved a 69 year old former attorney who went into Northwestern Memorial Hospital on June 1, 1995 for triple by-pass surgery. On June 4, 1995, his chest tube was removed which resulted in a pneumothorax. This pneumothorax resulted in him becoming short of breath and eventually led to a cardiac arrest and brain damage. The defense claimed his injuries were from a heart attack from his underlying cardiac disease. On March 10, 2004, Plaintiff was pregnant with her first child. Plaintiff presented to the emergency room at Lutheran General Hospital at approximately 6:00am due to the onset of active labor. Her daughter’s gestational age was 40 weeks and 5 days. Her daughter was delivered vaginally via vacuum extraction at 3:31pm by Isabel Gomez, M.D. Upon delivery, the baby was noted to have several serious health issues, namely the presence of meconium; neonatal depression; hypoxic ischemic encephalopathy and seizure disorder. The baby spent three weeks in the pediatric intensive care unit before being discharged. Karina sustained a brain injury. As a result of her brain injury, Plaintiff’s daughter has speech problems; attention deficit hyperactivity disorder; deficits in fine motor and gross motor skills necessitating braces (AFO) for walking. The defendants failed to warn the plaintiff, a 28-year-old man, to use a lowering hook when placing explosives in a hole, rather than dropping them down. The resulting explosion caused him to sustain serious injuries to his arm, leading to its amputation, and the loss of an eye. of Lake County, Illinois, and the largest sum of money ever paid in the history of Illinois involving bacterial meningitis. On August 29, 1996, The Plaintiffs were visiting their daughter in Lyle, Illinois when D. began complaining to severe back pain. An ambulance was called and he was transported to Edwards Hospital in Naperville, Illinois. After an initial diagnosis of descending aortic aneurysm with dissection, D. was transferred to Loyola University Medical Center on August 30th. During this hospitalization, D. was further evaluated and scheduled for cardiac surgery. On September 3rd, while hospitalized and awaiting surgery, D. experienced cardiac arrest and an anoxic episode that rendered him comatose. As a result of not being properly monitored while on Propofol. He is now 68 years old, lives with his wife, but suffers from permanent brain damage. Plaintiff’s Decedent was diagnosed with breast cancer. During a biopsy of her breast she experienced an anaphylaxis attack according to the defense and medical examiner or a pulmonary embolus according to plaintiff. The plaintiff further alleged a DVT or pulmonary embolus was never ruled out. During the hospitalization she was placed on Heparin prophylaxis which was later discontinued because of a suspected adverse reaction (HIT) without ordering an alternative anticoagulant. She experienced a fatal pulmonary embolus two days later. She was a school teacher who left surviving a husband and daughter. After sustaining numerous injuries in a motorcycle accident, including a C-2 "hangman's" fracture and bruising of his spinal cord, student ended up paralyzed as a result of the failure to adequately replace his blood lost in the accident and appropriately intubate him. This case involved the trial of a defamation case on behalf of an Illinois Supreme Court Justice. This is the highest defamation verdict and the highest subsequent settlement for a judge in the United States history. On April 27, 2004, M. K., a 57 year old medical malpractice defense lawyer with the law firm of Hinshaw & Culbertson, underwent a stress test at an office location near his home. The stress test was ordered by his internist at Northwestern Medical Faculty Foundation. The stress test results were faxed and mailed to the Faculty Foundation. However, the test results were not reviewed due to an administrative error and K. was never advised that the results were abnormal and required cardiac catheterization. He experienced sudden cardiac death on August 9, 2004. Decedent passed away on June 10, 2012, weeks after giving birth at Advocate South Suburban Hospital. Following birth she presented twice to the emergency department at Advocate South Suburban Hospital with complaints of shortness of breath. At both visits she was found to have leg swelling and an elevated blood pressure. The emergency room staff did not contact her obstetrician and she was discharged without diagnosis beyond shortness of breath of unknown etiology after pulmonary embolism was excluded. Urine testing was not done to assess for protein. She had normal blood pressures throughout her pregnancy and labor and delivery. She was experiencing undiagnosed pre-eclampsia that led to eclampsia on June 1, 2012 when she seized. The Decedent was survived by her husband and two children. Co-counsel with Joseph A. Power, Jr.
Child running into street struck by auto which failed to reduce speed to avoid an accident, resulting in brain damage. On or about 4/20/02 a chest x-ray of the left lung was read by Dr. Wiggins as normal. Dr. Kirby saw something suspicious in the upper left quadrant of the lung and called another radiologist who also read the film as normal. No physician followed up nor advised M., a law professor, of possible abnormalities despite thirteen (13) subsequent visits to Dr. Kirby. On or about April 29, 2003, lung cancer was finally diagnosed from a follow-up x-ray. The lesion grew from one (1) centimeter to 6 x 9 centimeters and metastasized to other parts of her body. She died on April 11, 2004. M. died from the undiagnosed lung cancer with a delay in treatment of over one year. The lung cancer went from non-metastatic and curable to metastatic and non-curable due to the delay. This case involves a minor Plaintiff who fell at school in gym class and struck the back of his head on a tile floor. A. was transported from school to Olympia Fields Hospital and transferred within a few hours to Advocate Hope Children’s Hospital to receive pediatric intensive care unit monitoring and management. While at Advocate from 2:45 p.m. on December 16, 1999 until his death at 9:26 a.m. on December 18, 1999, A. did not receive a CT scan until 10:15 p.m. on December 17th. The CT scan performed at 10:15 p.m. was ordered to be done in the a.m. on the 17th. Plaintiffs alleged that there was a failure to obtain a CT scan as ordered. After obtaining the image in the late evening of December 17th, no radiologist or other physician interpreted that scan until after A. suffered a respiratory arrest at 4:30 in the morning on December 18, 1999. The scan taken in the evening of December 17th revealed a fracture of his skull in the occipital bone, a right frontal lobe hematoma and brain swelling. A. suffered an arrest on the December 18th as a result of increasing intracranial pressure and brain herniation. C. underwent knee surgery on March 8, 2002. After the surgery he was given full strength Fentanyl/Bupivacaine and Cloridine by epidural for pain. He remained uncomfortable so the epidural was pulled and he was started on Morphine. Thereafter the epidural position was reconfirmed and he was restarted on Fentanyl/Bupivacaine and Cloridine as well as the Morphine. At approximately 1:00 a.m. the attending physician noted the patient was comfortable, sleeping but easily arousable. At 4:00 a.m., a nurse, while administering antibiotics, noted that Plaintiff was pale and unresponsive with his pulse rate dropping from 20 to 0. He was in asystole and a Code was called and CPR commenced. Plaintiff contends that the pain medicines administered were respiratory depressants which led to a respiratory arrest and hypoxic anoxic brain damage. Under the circumstances an apnea monitor and oximeter were required by the standard of care to prevent a respiratory arrest. This brain damage ultimately led to his death six days later, on March 14, 2002. A 29-year old carpenter, fell through a skylight hole 38-feet to his death while erecting a skylight on a penthouse roof at the Eugenie Terrace Development. This was the largest verdict for a wrongful death of a tradesman in Illinois. It is also the largest wrongful death verdict under the Structural Work Act in Illinois history. The decedent left a wife and a 5-year old son. WGN camera man ran red light and injured previously disabled Vietnam veteran. Plaintiff decedents resided in a home in Chicago, Illinois. They installed a security system in their home through Defendant Keyth Security Systems, Inc., that included burglary and fire alarms. A fire erupted in their basement at approximately 2:48 a.m., which sent a signal to Defendant SAI for low temperature. Neither Keyth nor SAI notified the Plaintiff decedents, the fire department nor the police. Plaintiff decedents both died in the bathroom of smoke inhalation trying to escape the fire. When the police and fire department arrived, no alarms were sounding. In the opinion of Plaintiff's consultants, the alarm system violated the municipal code, and was improperly placed, wired and programmed. In addition, there were significant maintenance issues. A 53 year old disabled female underwent a planned two-stage neurosurgical procedure to correct a severe thoracic kyphosis. Following the second stage, there was progressive reflex abnormalities and loss of motor function which went unreported to physicians responsible for her care. The delay in communication resulted in a delayed diagnosis and ultimately permanent paraplegia from thoracic spinal cord compression. Breach of contract: After a complex trial, a Cook County Judge ordered Ron Gidwitz, Donald Trump’s Illinois finance committee Chairman, to pay his former attorneys $5.7 million in unpaid legal fees. Judge Patrick Foran Lustig ruled that Gidwitz breached his contract with Ungaretti & Harris by refusing to pay fair and reasonable legal fees incurred on his behalf. On August 14, 2003, Decedent, a single, twenty-two-year-old female underwent laparoscopic out-patient surgery at Hinsdale Hospital. Following her surgery, Tricia was discharged from Hinsdale’s post-operative recovery unit by the nursing staff despite having, what the family described as, complaints of feeling faint, nausea and severe pain in her abdomen. She was discharged from the Out-Patient Surgi Center at 7:00 p.m. on the evening of August 14, 2003. She returned to Hinsdale Hospital at 12:30 a.m. on August 15th with severe abdominal pain and was admitted. Her condition worsened throughout the day and she was eventually taken back to surgery at 6:30 p.m. Prior to beginning the exploratory surgery to determine the cause of her severe abdominal pain, she aspirated during anesthesia induction. During surgery, another surgeon identified the perforation to her small bowel and repaired it. Unfortunately, her condition deteriorated and she died the following day. H., a 13 year old minor, sustained a traumatic brain injury (TBI) on June 20, 2000 when he was struck by an Airborne Express / DHL delivery van at the intersection of Devon and Oakley Streets in Chicago, Illinois. At the time he was struck, H. was traveling eastbound on the northern sidewalk of Devon Street and was struck by the northbound Airborne Express delivery van as it proceeded northbound on Oakley from a Stop sign. Plaintiff maintained that H. had the right of way and that the defendant was operating his vehicle too fast for conditions and was negligent for failing to yield to a pedestrian in the crosswalk. Defendants maintained that H. emerged from behind an illegally parked vehicle and entered the crosswalk too fast for the driver to stop his vehicle. The defense further maintained that H. was not injured to the extent claimed by Plaintiffs. H. is now an adult and lives independently in a supervised living environment. Plaintiff’s decedent was a 15 year old camper at defendant camp. During a day trip to the beach in New Buffalo, Michigan, the camp counselors failed to supervise the campers and allowed them into the water. Red flags were posted indicating unsafe and hazardous water conditions, including rip currents. Plaintiff’s decedent was swept underwater by a rip current resulting in his death. The summer camp failed to properly train its counselors and supervise its campers resulting in the drowning of a three sport athlete. A 50-year-old woman died in March 2001 after doctors at Cook County Hospital allegedly overlooked indications of cervical cancer that showed up in test results. Plaintiff attorneys said the woman’s Pap smears in 1996 showed the possibility of cervical cancer, but the hospital failed to run additional tests that could have confirmed cancer while there was still time to treat it. Doctors identified the cancer in 2001, while the woman was undergoing a hysterectomy and when it was too late to treat it. 40 year old female presented to a local hospital for an elective laparoscopic cholecystectomy for her cholecystitis and cholelithiasis. During the laparoscopic surgery, the defendant surgeon placed clip(s) upon her common bile duct and hepatic duct(s)/artery which caused an iatrogenic injury (ligated and/or divided duct and artery). After a few days she presented to the defendant physician with complaints of episodic pain and discolored urine and was admitted. After her admission, she was emergently transferred to an academic hospital where she was hospitalized for months and underwent a liver transplant and multiple V-P shunt removal and/or revision procedures because bile leakage. She requires anti-rejection drugs for her transplant on a life-long basis and monitoring for liver rejection. Co-counsel with Joseph W. Balesteri. Medical Malpractice: After receiving a history of a patient falling out of a cab going 25-35 miles an hour, hospital staff, including trauma, neurosurgeons and nurses, provided inpatient care to Decedent. On the sixth day of hospitalization, the neurosurgical service and the nursing staff failed to do timely neuro checks, obtain CT scanning, and failed to diagnose increasing intracranial pressure, which had occurred in a delayed fashion following head trauma. That resulted in brain stem herniation and death. The patient was 46 years old at the time of his passing. He is survived by his wife, who remarried prior to trial, and their two minor children. Lead counsel Joseph A. Power, Jr.
Medical Malpractice: 61-year-old male underwent a colonoscopy, and a possibly palpable nodule was identified within the colonoscopy report. The report was reviewed by the ordering primary care physician; however, no further workup was obtained, whether by urologic consultation or a PSA testing. Approximately, one year later, the primary care physician did order a PSA and urologic consult, which revealed abnormalities, prostate cancer, and lymph node involvement. Due to increased risks of mortality associated with delayed diagnosis, this case was settled without the need for filing. Lead counsel Joseph A. Power, Jr.
After laboring, a maternal fever developed and over the next two hours abnormal heart tracing were present which resulted in a stillbirth. Defendants failed to timely perform a c-section to avoid fetal injury. The parents were the sole heirs. Co-counsel with Joseph W. Balesteri. 2004 The Top Vote-getter in a Poll of Illinois Lawyers of the Top Attorneys in Illinois. Published in Chicago Magazine. 2002 Chicago Magazine, "30 Tough Lawyers," named one of the 30 toughest lawyers in all fields in Chicago. Those listed are, according to the magazine, attorneys you want "for you, not against you." 2000 Awarded the Civil Justice Foundation's Special Commendation Award for his thoroughness, tenacity, and courage in uncovering and disclosing the "License for Sale" scandal in the State of Illinois secretary of state's office as part of the Willis case. 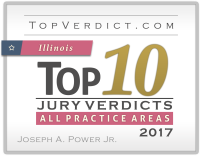 1999 National Law Journal named as one of the top trial lawyers in the United States and one of the top four plaintiff's personal injury trial lawyers in Illinois. Listed by Harvard Law Graduates Naifeh and Smith in their book The Best Lawyers in America (1987-present).